Mark-Linn Baker (Cousin Larry) and Bronson Pinchot (Balki) in "Perfect Strangers"
It's the reunion you've ALL been waiting for! Bronson Pinchot & Mark Linn-Baker are Perfect Strangers no more! They starred in the classic sitcom at the heart of America’s favourite Friday night line-up. 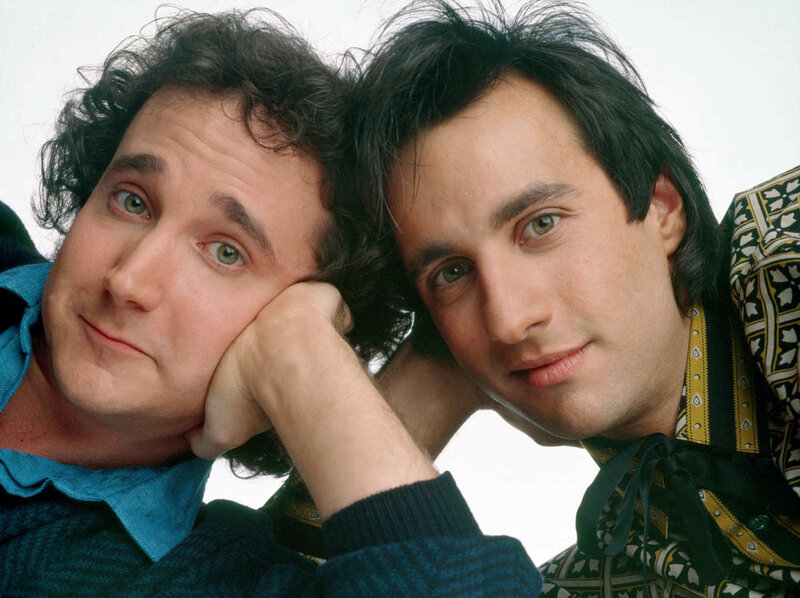 Now they're back in Primetime as every episode of Perfect Strangers is NOW available on Hulu! As a matter of fact - you can watch all your favourite episodes of Perfect Strangers again, and more than 800 episodes of America’s favourite Friday night lineup from the 1990’s on Hulu, including Step By Step starring Suzanne Sommers and Patrick Duffy, Full House, Family Matters, and Hangin’ with Mr. Cooper. Bronson and Mark have only done a handful of interviews together since the show ended in 1993 and now that they're back together it's as though no time has passed. Perfect Strangers followed the rocky coexistence of mid-western American Larry Appleton (Mark Linn-Baker) and his distant cousin from eastern Mediterranean Europe, Balki Bartokomous (Bronson Pinchot.) The show found its niche as anchor for ABC's original TGIF Friday-night lineup. Mark Linn-Baker was most recently seen playing the pivotal role of himself in the final season of HBO’s acclaimed series The Leftovers. He has had a busy career on Broadway, starring in scores of productions ranging from the revival of On The Twentieth Century alongside Kristin Chenoweth, to You Can’t Take It With You opposite Rose Byrne and James Earl Jones to Alice In Concert, with Meryl Streep. His film and other television credits include Woody Allen’s Manhattan, My Favorite Year, and TV’s The Good Wife, Blue Bloods and Ally McBeal. Bronson Pinchot’s many film credits include Risky Business, Beverly Hills Cop, True Romance and The First Wives Club. In 2012, he starred in his own reality series, The Bronson Pinchot Project on the DIY Network. The program is based on his hobby of restoring old homes using salvaged materials. Pinchot has worked extensively as an audiobook narrator, and was chosen by Audible.com as their 2010 Narrator of the Year. I had the opportunity to chat with Mark Linn-Baker and Bronson Pinchot via satellite from New York about their best memories from Perfect Strangers and much more! Click below.